You are here: Home » Podcast » The MuscleCar Place Podcast – Episode #61 – SEMA Recap and the 2010 Optima Ultimate Street Car Invitational! The MuscleCar Place Podcast – Episode #61 – SEMA Recap and the 2010 Optima Ultimate Street Car Invitational! Click HERE to download the podcast show in iTunes! I am dedicating this week’s episode of The MuscleCar Place podcast show to a recap of the 2010 SEMA Show and the Optima Ultimate Street Car Invitational! ’69 Camaro competing at the Optima Invitational. I attended the 2010 SEMA Show in Las Vegas last week, which was one of my big goals for the year. I had 2 days to see it all, but those 2 days were a complete blur of automotive overload! That being said, I hit all of the areas that I wanted to (as stated in Podcast Show #60) and saw all of the show cars and new parts that I could. Initially, the mass amount of choices was somewhat overwhelming, and I found it difficult to focus on which area to concentrate first. That feeling lasted for just a few hours….and then I had the opposite problem. After a while it was like trying to eat chocolate cake for every meal. No matter how good it tasted at first, the 2nd, 3rd, and 50th bites became expected. I focused on the area of the show that was most relevant to muscle cars and was not disappointed. 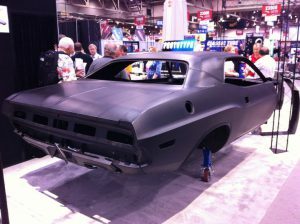 The New Dynacorn Challenger body! The New Dynacorn Gen I Mustang Convertible body – license is pending! By far, the thing I wanted to see at SEMA most wasn’t at SEMA at all! The Optima Invitational is an annual event held the day after SEMA ends in Pahrump, NV at Spring Mountain Motorsports Ranch. 50 SEMA-Show calibur owners and their cars are invited to participate provided: 1) they have the guts to do it, and 2) they can find a set of 200-tread wear tires for the event. 40 of the 50 invitees had been selected prior to SEMA either by invite or by racing their way in at one of the many qualifying events held throughout the year. The event was dominated by Pro-Touring muscle cars, with 1st and 2nd Gen Camaro’s being the car of choice. 2010 OUSCI Champion – Mark Stielow! Image Courtesy Detroit Speed. The 4 segments that divided the event were the Road Course, the Start/Stop Challenge, the Autocross, and Design. For the 3 driving segments each driver was given 3 runs, with the best of the 3 being the the “real” time used for judging. Each individual segment had a winner, with an overall winner being a combination of the 4. The great Mark Stielow won the overall event with his LS9 powered ’69 Camaro and major driving prowess, but his competition was fierce. Everyone was blown away by the “Polly” Trans Am from Holland – a 1400 HP 1986 Trans Am! Polly looped the Trans Am on one of his first road course passes at high speed right in from of the crowd, and he didn’t hit a thing. Polly loops his Trans Am at high speed….and hits nothing! Jimi Day, President of FM3 Marketing was amazed by the level of cars and competition. He stated that 52 cars were allowed to enter the envt, and at the end 51 were running. Not too shabby for a bunch of hopped up “show” cars, right? The video below is a compilation of pictures and video from the event. Enjoy!